﻿ Corals getting too big for your reef? Time to frag! What do you do when your corals are literally overgrowing everything? Author, left, with friend and reef-hacking assistant Duane. When you set up a reef tank, and especially if you do it well, your corals will respond with exceptional growth. Couple that with my general rule of keeping my hands out of my tank, and frags grow into colonies, which grow into massive stonies. My 400g reef is 7′ long x 3′ wide, and I had about four colonies that had grown so large they cast a massive shadow over the rest of the reef, to the detriment of those below. The solution was to pull those species, allowing light and flow to reach all the corals of the tank. This job was way more than I could handle by myself, so I called in my buddy Duane. He’s got a knack for hacking up a beautiful reef, and a few months later it looks even better. If only I could match that skillset, right? Calling in reinforcements was my best option. Duane started cutting, I tried to limit my complaining, and my local club members attended to watch the carnage…or should I say to reap the rewards of attending: they were fed BBQ, had plenty of drinks to choose from, and left with a bunch of frags to put in each of their own tanks. This event took place mid-September, 2017. What I filmed was the process of pulling out these corals, which I thought would be of interest to others. Before we removed anything, we mapped out some sections that would be ideal as mini colonies that we could replant on the rockwork. 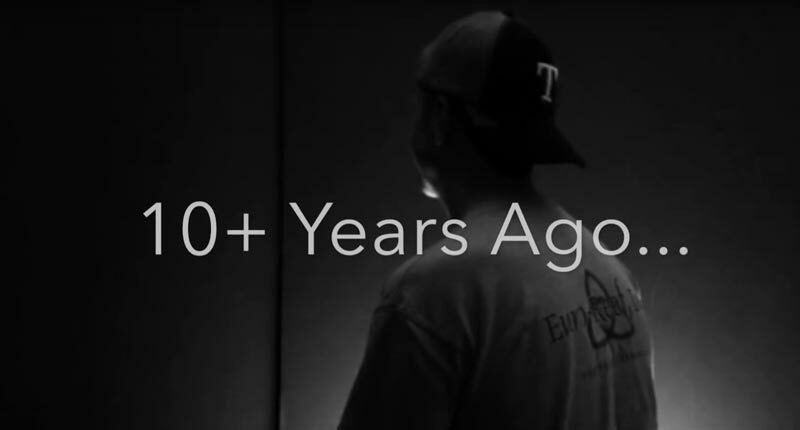 By the end of the video, you’ll see what the tank looked like back then. Here’s the current look (mid-January 2018), a few months later. An updated view of the reef, taken mid-January, 2018. That day was a hard one for me because I’m not a fan of change. Because I document how my reef grows over time, and when things are moved or even removed, it threw off the growth pattern I would normally track. However, there was truly no other choice. The aquarium had corals at the surface, and many corals had already succumbed to death due to lack of light, or were simply overgrown by other faster-growing species. Several buckets of dead skeleton were pulled from the system that day, which was soaked in tap water, rinsed repeatedly, and eventually crushed to re-use in my calcium reactor. As time passed, I grew accustomed to the new look and enjoyed seeing the open swimming space for all the fish, such as Spock (the Naso tang I’ve had since 2004). One happy thing to note: I didn’t lose any corals to this event, not even the newer SPS additions. There were no fish losses, either. The reef never skipped a beat, and water parameters continued to be stable, although it didn’t need nearly as much magnesium as previously. That massive “Purple Grape” Montipora really soaked some up, but once the bulk of it was removed it was easier to maintain magnesium at target levels. If you want to reset your reef, bring in some helpers and have a solid plan in mind. Have plenty of pre-mixed saltwater ready; you’ll need it. If everything goes smoothly, you’ll end up with a successful re-scaping that will transform into a thing of beauty within a few months. 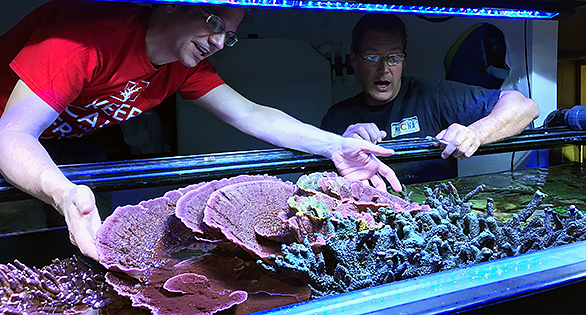 Marc “melev” Levenson has been in the hobby since 1998, blogging his experiences about his own reef on his website melevsreef.com to help others learn husbandry skills. Most recently he’s become an online personality with tens of thousands of followers on his YouTube channel (@melevsreef) also geared at helping other reefers through his personal experiences. His website’s articles, blogs, and Critter ID cover topics like pest control, feeding techniques, working with acrylics, reef photography and water chemistry to name a few. 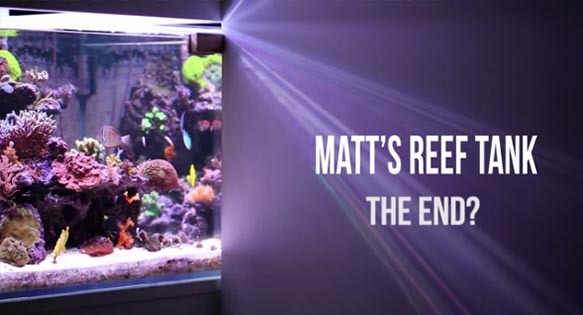 His online store carries many products like his RODI systems, custom sumps and even includes some items that he himself invented as clever solutions to make reefkeeping easier. Marc is a nationally recognized speaker, who regularly recommends supporting local club events, shopping local fish stores, and interacting with others via social media. His other hobby is diving, exploring natural reefs. His current tanks are a 400-gallon reef and a 60-gallon anemone cube, filled with captive bred fish and aquacultured corals. Thanks for such a delightful view of your experience in creating a new reef tank. Great video Marc and Trido.